the storm of fire and ice wrought by the clash of the Immortal Kings Magnus of Eod and Brutus of Zioch have stained the land and its people with rivers of blood and filth. a number of people have vowed to seek help and retribution for such devastation and affront, thereby unleashing a series of events that would usher in a new age across Geadhain. 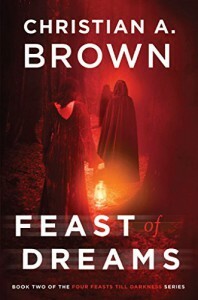 Feast of Dreams continues where Feast of Fates left off. the stakes involved have increased in this second volume as new players are introduced and familiar ones are encountered once more. the plot has thickened as well and there were more twists and revelations that i never saw coming. new alliances are forged as old ones are broken off. secrets are brought to light and mysteries that i thought were resolved beget more wonders. it may appear to the reader that a large part of the novel is steeped in darkness and uncertainty over an impending war. yet within this dim and grim scenario are seen glimmers of light and hope as our major protagonists display awe-inspiring fortitude, patience, and determination. even at the hands of their adversaries or with death staring them in the face, these men and women would always forge ahead. later, i realized two themes that were central to the whole novel and the reason why our heroes never gave up despite the whimsical forces swirling around them - love and family. these themes were there all the time and i failed to recognize their worth and their power until the very last chapters. even the villains were not exempt from their potency. Christian A. Brown has woven a worthy literary sequel. the writing is as constant and flawless as ever. i continue to be mesmerized and impressed by his unique style of blending prose and poetry and by his fertile imagination. savoring this second feast only made me whet my appetite for more and i look forward to the next books in the Four Feasts Till Darkness series!